This CD was initially available only at their Summer 2005 live shows. 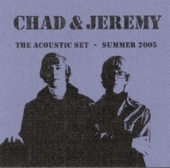 Included are six of the "Acoustic Set - Summer 2004" tracks, plus four brand new songs. "Lady Wants A Gentleman" and "Before And After" are featured in new mixes compared to last year's release. Like its predecessor, it is not a pressed CD, but rather a CDR printed to demand. It is packaged in a slimline case like a CD single. This CD-R was available at C&J's 2005 concert gigs and for a short time on Electric Paintbox online. It is no longer available, although several of these tracks were re-worked and re-recorded for the ARK-eology album and can be heard in their final form on that CD.